Joey and Eloise would like you all to get involved in a two part Road Safety completion. Part 1: design a road safety mascot for Harestock- he will be in assemblies and share his/her thoughts on JRSO TV. Part 2: create a Harestock Road Safety song! The winning song may be included on the school website. The winning mascot we are hoping to get made ready for September! Design a poster to show ‘What road safety means to me’. It can be created on plain paper or the computer. Try and make it interesting, eye catching and promote being safe around roads. You can draw pictures, make slogans and use bright colours. You could even make a road safety song to go with it! Please hand your creations in to the office or Seth and Eloise by the end of the first week back after half term (1st March). Winning entries will be displayed at school and on the website. Road Safety Role model Shout out! The Harestock Junior Road Safety officers (JRSO’s) want to make a shout out to all parent Road Safety Role models out there! We know that some of you are really ‘up to speed’ on your Highway Code and the updates/ developments that happen regularly. Well done to you for checking on the rules and regulations. Quiz: Do you know what an amber traffic light really means????? 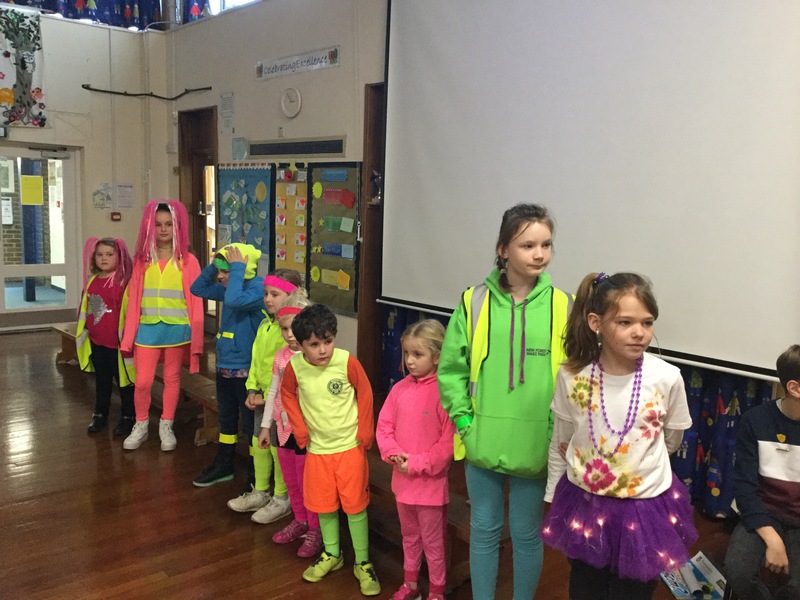 Well done to everyone who came dressed to ‘Be Seen’ on Monday 19th November to raise awareness for National Road Safety Week. The children were wearing their brightest clothes: hi-viz jackets and plenty sparkly and flashy accessories! There were light-up trainers, fluorescent sports kits and even flashing skirts. The day ended with a luminous fashion show. The most blinding pupil from each class modelled their outfit and walked down the Harestock Catwalk! Well done to all the finalists from each class. Congratulations to Chloe from Otter Class who shone the brightest for KS2 and Blake from Owl Class who sparkled for KS1, both received Road Safety prizes. Thank you also to the children who attended the Road Safety Workshop lead by the JRSO’s Seth and Eloise.